With vast mountains in the north and water on the south, east and west boundaries, India is a unique country. It was able to develop along side Egypt, Greece, Japan and China without outside influence, allowing the country to maintain its identity as a culture even when the British colonized it in the 18th century. Much like Egypt, India developed monuments that tell people its story through architecture; however, unlike Egypt, these monumental structures were "well-grounded in reason" (Abercrombie, 193). 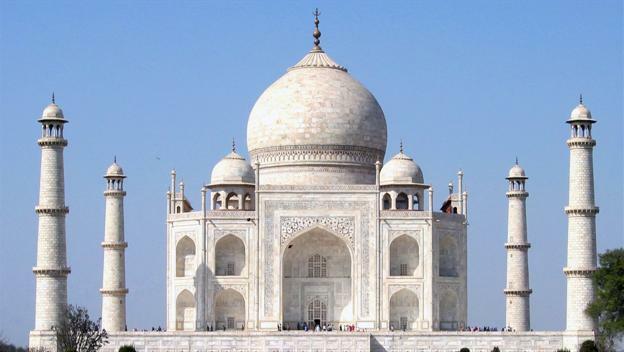 Monumental structures could have been places of worship, homes for royalty, or tombs - such as the Taj Mahal. The monuments mentioned above were influenced by a collection of rules regarding the relationship between what is real and what is spiritual. The rules collection is a result of many religions being practiced throughout the sub-continent's regions. Not unlike other areas of the world, spiritual beliefs guided architecture and design- every building has a plan. In India, if the region/area was Buddhist or Hindu, the circle guided practices for religion and architecture- the belief being the circle represented the universe, and its physical shape guided meditation. In other areas, the square or grid played a significant role: a square would represent a deity and its placement within the grid/plan related to the deity's importance - the center being the 'home' for the most important deity. Some of the earliest temples where stupas: a mound like structure with an ornamental, tiered umbrella (chattra), accompanied by a path, fence or railing with gates at compass points. Stupas, being circular in plan were favored among Jain and Buddhist believers; it is even rumored/believed that chattri-topped stupas gave influence to the pagodas of Japan and China. Key among cave temples was the floor plan- very similar to the basilica of early Christian architecture- what set it apart was the ornamentation, for example: the end of the nave was topped with forms similar to the stupa and chattra. Murals were colorfully painted on the walls, elaborate carvings covered the support columns. Ellora and Ajanta are the largest collections of cave temples in India; the Ajanta temples were built fist and the Ellora temples followed 500 years later. Built for members of the religious orders, temples in India are mostly constructed of stone and those of the Northern part of the country are tapering structures that climb into the sky. Due to material constraints, these structures are massive from the exterior, but inside they are smaller than a person may expect. The main area, being surrounded by a hall for travel within the structure, is entered through a formal entry space. Interior and exterior walls are elaborately carved, either with withering figures (think Kama Sutra) or geometric patterns that are fundamental to many styles of design. Any windows are screened with carved stone or intricate wood screens. The best examples of Northern Temples are at Khajuraho. Southern temples are a bit more simple when compared to their northern counterparts; as varying regions can translate to varying religions, the structures change in style. Based on more rectangular plan, the southern temple is a series of rooms aligned with increasing ceiling heights. 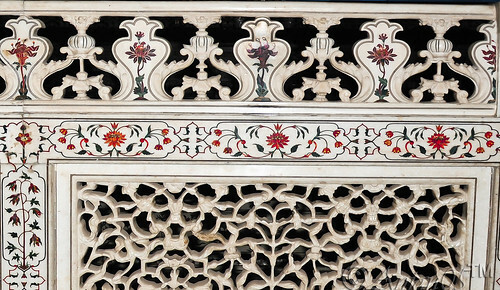 Motifs and decoration will varying based on the practicing religion in each temple. 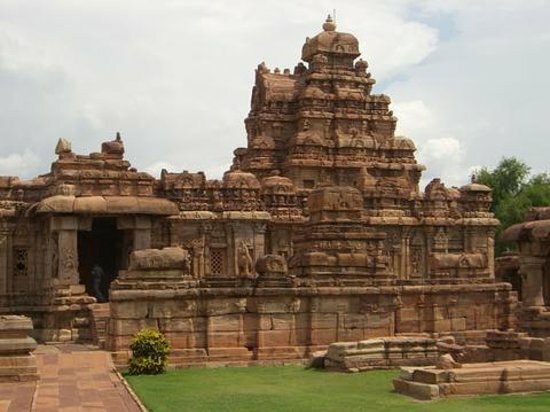 Good examples of the Southern style can be found at Pattadakal, where there are some temples blending the two regions' styles. While not a temple, Taj Mahal is a religious structure - and perhaps the most famous example of Indian architecture. Built as a mausoleum for an emperor's late wife, it does have religious connections. Construction was completed in 1648, seventeen years after the wife died- perhaps because it is built from marble and precious stones; the white marble allows it to stand in stark contrast against India's naturally vibrant and rich colors. It is a superb example of balance within an architectural composition (see picture at top of post). Entered on the south side, a visitor first encounters a ring of connected circles, even though the plan is made up of nine squares. The decorative elements on the walls and floors included patterns ranging from floral to geometric, pietra dura - precious stones inlaid to the walls, and even utilized Islamic calligraphy. All of these decorations are not the dominant feature of the Taj Mahal. Rather its forms dominate, be it the massive exterior structure that stands out in the tropical landscape, or the human-scaled first- and second-story interiors. wood frame with rope laced in to support the bedding material, because most seating was accommodated on the floor with cushions and rugs. People have rank were accommodated with thrones carved of local woods, inlaid with precious metals or stones; these thrones were still softened with cushions- made of finer materials. Lacquering and inlay practices, as well as cane chairs traveled the Silk Road back to Europe during the 16th through 18th centuries. Wicker would follow eventually and become a staple furniture style for American porches and European Sun Rooms. Wood and stone both received elaborate carving for architectural applications (pillars, columns, windows) and every day objects such as bowls, cups, or storage containers. Detail on such pieces was every exacting and delicate, only added value to pieces that were exported to other areas. India is a large textile exporter, be it muslin (beginning fabric for fashion designs) or silk, which they first imported from China before cultivating their own worms. The country excels with dyes, however; with such vibrant surroundings and centuries of their own unique cultural development, it is no wonder that, with a love of colors, India would grow to be a large exporter. Their expertise arises from their use of mordants- salts mixed with pigments that allow for the pigment to attach to a normally resistant fiber, allowing vibrant hues to adorn cotton and silk. The passion for color in India has religious roots - often times a color would represent a deity, and there is evidence supporting color as a use of showing the caste of a citizen; but these reasons aside, each color symbolized something: white for purity/mourning, saffron yellow for youth/spring, and red for love, early marriage. Some of these interpretations permeate our culture here in the U.S: red roses for valentines, white for purity, and a less intense yellow is a color for spring. There were occasions when they printed onto dyed fabric, creating dazzling floral or geometric patterns atop the vibrant cloths. - This gave rise to the popular Paisley that has adorned varying fashions here in the U.S., most notable is the $1 bandanna from Wal-Mart - I use one when I go biking. Paisley is a very stylized floral leaf believed to have roots in Persia, but its ties to India come from Kashmir shawls. Carpet, perhaps one of the most valuable textiles ever produced, with numerous uses, was utilized in India as a status indicator, and only for formal, very important rooms. As such use drove its production, carpets were woven with meticulous care from fine goat hair (cashmere to us Westerners), with about 400 knots in one square inch. To keep the carpets flat and prevent them from sliding on the floors, India developed ornate carpet weights to be placed at the carpets corners. Some such weights were ornamented with pietra dura, making the space more of a status symbol if you could afford such stones for the intricate inlay work.